The same great subtank coils, now housed inside a compact casing! 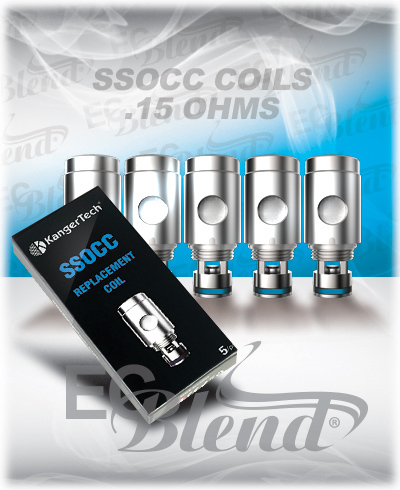 With the awesome performance as the original OCC coils, these new coils are even compatible with more of Kanger's products. These replacement coils feature pure organic Japanese cotton wicks. These 0.15 ohm coils are made from pure Nickel (Ni200) wire, making it possible to monitor and limit the temperature the coils reach. Because these coils are only for use on temperature sensing devices, like the Koopor 60W TC, Kanger has marked the silicone rings blue for easier identification. I had been using the big square ni200 heads for a long time. Didn't know how these would compare. Well they are very good. The smaller size leaves more room for juice in my Kanger Protank 4. Big juice holes so there is no problem with dry hits. Big tasty vapour hits. The resistance is not near the listed .15ohms. More like .22ohm. The older square heads were the same. Consistent great taste without vapour tongue. Long lasting. Highly recommended!! Click the button below to add the Clearomizer Replacement Head - Kanger - Ni200 OCC Coils - 5 Pack to your wish list.